A little more than two months after Hurricane Matthew crossed Cuban eastern region, 63 percent of the families affected in Baracoa municipality have received the necessary resources to repair their homes. Carlos Martínez Turro, Vice-President of the Provincial Administration Council for Investments, told the press that about one-third of the families affected by the storm have already repaired the roofs of their houses and a similar figure has the materials to do it. 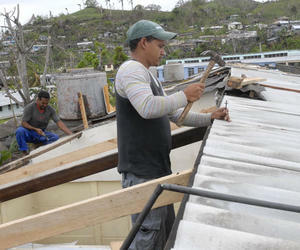 The significant recovery of the houses in this territory, he said, has been possible thanks to the availability of 62 and 48 percent of asbestos cement and zinc tiles, respectively, arriving from the provinces of Santiago de Cuba, Artemisa, Matanzas and Las Tunas, which productive poles contribute to the recuperative tasks. The official commented they have implemented several workshops to process the wood and seven mini-industries for the local production of construction materials, so the territory has nowadays a production capacity of five thousand blocks per day, and they are also working in the construction of new facilities for the manufacture of materials for floors and roofs. Martinez Turro also mentioned another project concerning the construction of some 700 houses in rural areas, which construction will combine blocks and timber in similar proportions.